Take Exit 203, CO9-S towards Frisco/Breckenridge. After exiting I-70, travel approximately 10 miles to Breckenridge. Take Exit 201, CO9-S towards Frisco/Breckenridge. After exiting I-70, travel approximately 10 miles to Breckenridge. Take a left onto Swan Mountain Road. After traveling approximately 5 miles, take a left onto CO-9S. Travel approximately 5.5 miles on CO-9S to Breckenridge. Once in Breckenridge ahead of the roundabout, keep right at the fork to continue on CO9-S.
Travel approximately 1 mile through 2 red lights; take a right onto Four O’clock Road. 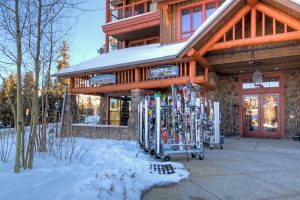 Travel approximately 0.3 miles, then take a left into the parking lot at the base of the Snowflake Chair Lift (2nd driveway on the left past King Crowns Road). You will see the BlueSky Breckenridge Facility, a sign for Charter Sports, The Spa and The Ticket Office. Enter the double doors, and The Spa is on the right.